Kanoe Hardin grew up in Santa Cruz, California, but has always had strong family ties to Maui. She earned a B.A. in Creative Writing from Linfield College, but returned to school to learn a new trade. She is currently a sophomore working toward an A.S. degree in Electronic and Computer Engineering Technology at the University of Hawai’i Maui College, where she is a member of Phi Theta Kappa and the Tech Club. 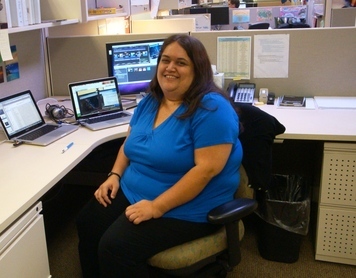 When she finishes her degree, she hopes to find a job as a system administrator or computer programmer. The Pacific Disaster Center (PDC) seeks to build a more resilient world by supplying both decision makers and the general public with the information they need to better prepare for, respond to, mitigate, and recover from disasters. In order to do this, PDC collects complex data sets from a variety of different sources, and transforms and consolidates them into an easy-tounderstand format. The goal is to harvest discrete and sparse data, translate and combine them into comprehensible and actionable knowledge, and to provide easy access for the public and emergency managers, so that the results can be used in life-saving operations and in mitigation planning. In order to reach out to more people, PDC is expanding its use of social media outlets such as YouTube, Facebook, and Twitter. As part of this strategy, we have created brief but informative videos that introduce and explain PDC’s Web-based and mobile applications and posted them to the PDC channel on YouTube. The newly designed and developed short videos incorporate graphics, photos, demonstrations of the applications, and archival footage. Once the YouTube channel is populated with instructional videos, we plan to continue enhancing PDC’s social media presence by finding ways to reuse, cross-link, and improve content of our YouTube, Facebook and Twitter sites. By providing this information in a mode that the online community is familiar and comfortable with, we hope to reach and educate more people about disaster reduction means, tools, and information, and ultimately, move one step closer to fostering a society that is better able to prepare for and respond to disasters.